Here's a beautiful wrap I made for my mom a few years back (for her birthday). Next time I think I'll use Caron Simply Soft to give it a more "lace-like" appearance (this is actually one of the recommended yarns). Bernat Satin would work, and so would Red Heart Soft yarn. This pattern was created by Dot Mattews and has been published in Crochetville Community and Crochet by the Hook. Skill level is Easy. It uses two hooks (sizes J and K) and just three simple stitches - (sc) single crochet; (ch) chain; and (dc) double crochet. You can find this FREE pattern by clicking HERE. Yes, I realize it's only August, but for crafters, this is the time we really start to get into heavy crafting mode so we aren't up all night on Christmas Eve finishing projects (well, at least we hope not to be!). Here's a fun little crochet project I made a few years back our ladies' Holiday Tea. Each person at my table had one of these candy cane covers (with mint chocolate candy cane) at their place setting with a stamped tag (my theme was "sweet" in pink and brown). And yes, I crocheted the place mats and cup doilies as well. These were created using Caron Simply Soft yarn in Chocolate and a size F hook. The pattern is called Victorian Candy Cane Cover by Cylinda Mathews. Right now it appears the link is no longer working (and I am hoping that I remembered to print this out). If it ever does come back online and I remember, will try to share it with you. It was free when I found it the first time. Getting into the holiday crafting frame of mind too? What are you making for this year's gifts or decor? Alas, my poor fingers needed a break from the needle and this darling bathing beauty just begged to be colored, so I set some time aside today to make this fun little card. I wish I had had some Our Daily Bread Designs water images, but sadly, I don't...yet. So instead, I used this free digi from Free Dearie Doll Digis (see link at bottom of post or click on name). 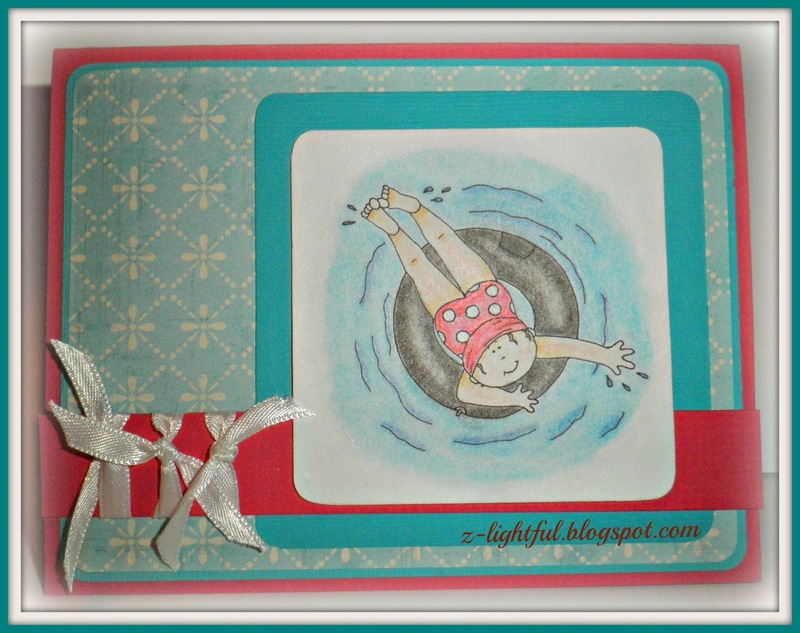 This card is for the Our Daily Bread Designs June Challenge using water. You can find the blog post about it HERE. Our Daily Bread Designs is so generous and helps ship boxes each month based on the number of participants in their challenges. 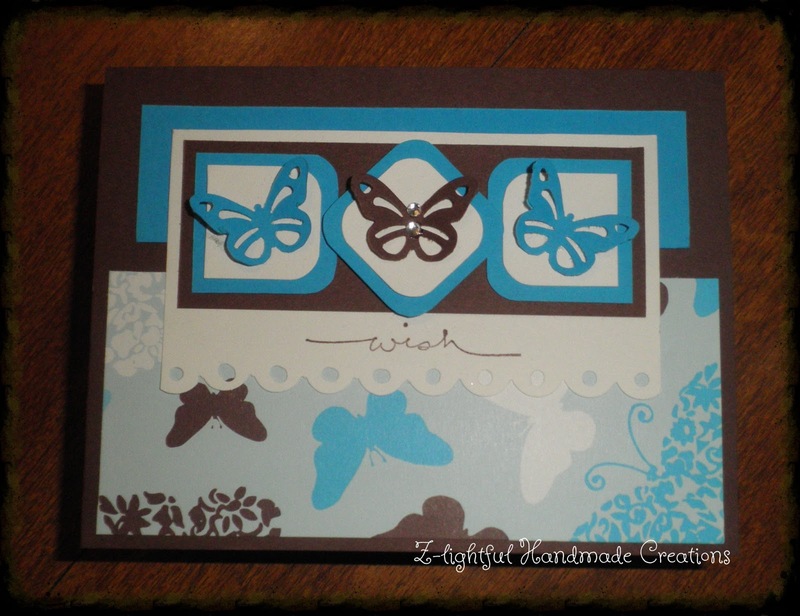 Last month, enough cardmakers participated that OBD shipped two boxes for Operation Write Home! Woohoo! About the Card: The solid colored papers are Bazzill. 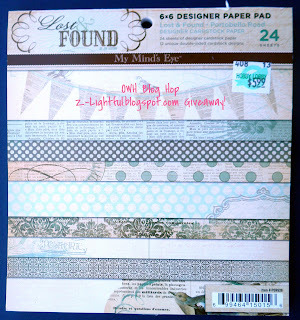 The patterned paper is actually some scrap paper I had from TPC Studio called So Delish. The image was colored using regular colored pencils (and oil). I struggled with placing the image so went to the trusty OWH Sketches and chose sketch number 56 (since it matched my image size). Thanks so much for stopping by! I hope this inspires you to create something fun this weekend. Now, back to the patches. P.S. 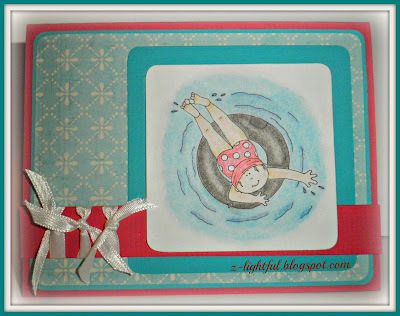 Am also using this for a June OWH Mid-Week Throwdown that incorporates "water" into the card. Good morning! :) I hope you all had a wonderful weekend. Ours was a lot busy and at times a bit stormy, but it was all good. Though I do confess that I'm thankful for a "normal" pace today. 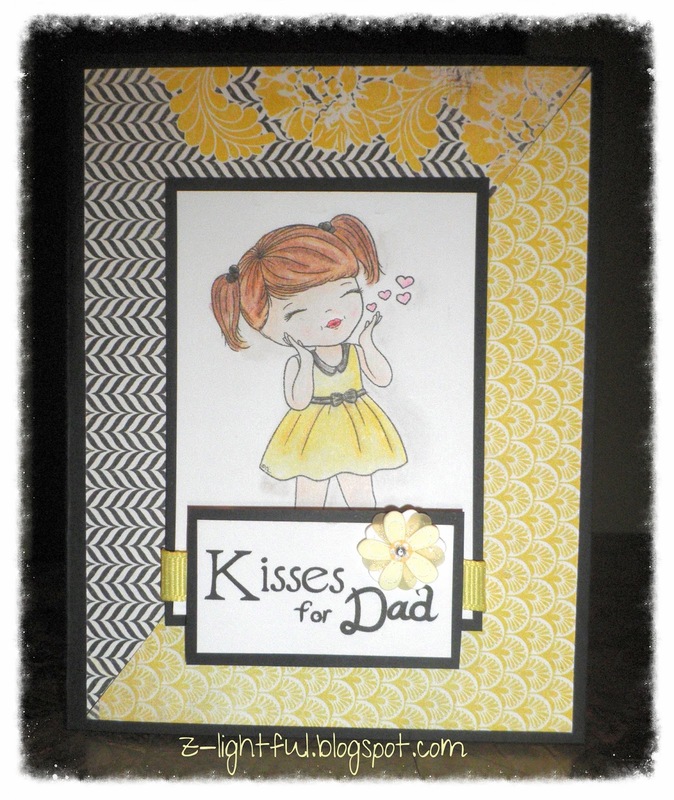 I did not get to blog about one last Father's Day card last week, so bear with me as I clear that off the to-do list. The base is Bazzill Licorice and the patterned papers are from Authentique. I need to look up the name of the collection, but it's the one I've been using a LOT of lately. :) As soon as I do, will edit this post to share it. The ribbon is simple grosgrain and the flower is from Jolees. It was very late, so I smudged some on the oil/gray shadow with that little paper pencil nubby (yeah, technical term, lol) and not enough on other areas, but dad thought it was great and that's what matters most. If you'd like to visit Beary Wishes to see if this digi set is still free, click HERE! Mr. Z strolled into the livingroom. His eyes brimmed with mirth and his lips barely contained a chuckle as he caught my attention. "I'm a '90s kind of guy." I blinked. So many thoughts tumbled through my brain as I tried to reconcile his statement with the man standing before me. Oh, he could be sentimental and tender when he wanted, but no one who knew him would place him anywhere near the category of '90's male. It didn't make sense. I was bewildered and he knew it. He patted his puffed-up chest. His smiled turned sly and then he delivered his punchline. "An 1890's kind of guy." We both laughed for a good five minutes. Life was good and everything made sense once more. I had almost forgotten that little memory until this weekend. You see, the digital stamp I ordered to make a card for Mr. Z did not download! Panicked since Father's Day was a mere few hours away, I went through the files I had already saved. When I saw those handlebar moustaches, I just knew I had to find the perfect vintage image to make a card fit for my 1890s hubby! The solid cardstock layers are Bazzill and the patterned cardstock is some I had on hand (will try to find out who makes it because it was nice and thick). The sentiment comes from Desert Diva - Hannelie. You can visit her blog by clicking HERE. The words bitmapped a bit when I shrank it down. I could have played with it a bit more, so it could have been "operator error" that caused the issue. I also should have made it a pennant cut to match the brown, but as I said, was in panic mode! 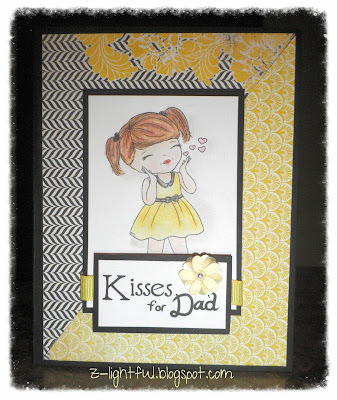 This sentiment was a freebie with other fun versions of "happy father's day" in the set! 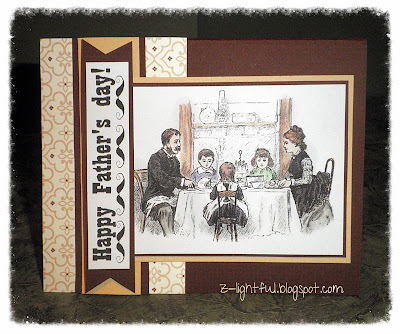 The vintage image comes from Free Vintage Digi Stamps and you can visit that site by clicking HERE. Since the image was so detailed and busy I did not want to color the whole scene. Instead I focused on the people, the chairs and just a bit of the walls behind the table (to tie it into the brown on the card). Mr. Z loved it! Especially when I reminded him why I made this particular card and we laughed again over this precious memory. During the summer months Operation Write Home holds a card-making Boot Camp. I missed out on the first challenge due to schedule and, honestly, hadn't planned on participating in this one quite yet. Alas, the blog post must have been simmering in the back of my brain though, because the card below just seems to fit. The theme for the June is Using Repetition in Design. If you want to hop straight to the blog post with the information on how to use this or see some great cards using repetition, be sure to click HERE. For this particular boot camp challenge, my theme was obviously circles/dots. The rosettes on her dress and bow carry through the circle/dot theme, just a little larger than the embossed dots. Even her hair/face fall into a "circle" category, rounded as the style is. I considered making the image smaller and putting it in a circle, but it was just a little too much, so left it in an oval with scallops. It still has the "rounded/circular" feel to it. The ribbon ties in with the little banner she's holding. OH! The dots around the edge of the pink layer were actually black marker but I couldn't find my plain organza ribbon, only the sparkly edged one. So, out came the Stickles to bling the image up and make it match! The color Stickles used is "crystal". I also added just a dab of Stickles to the center of each rosette on her little dress and bow. And I want to give a HUGE SHOUT OUT to Dearie Dolls Digi Stamps! Mary Ellen's blog is one of my favorite for digi stamps (now that I've discovered them) and the best part is how generous she is! This image is one of the many, many, many, free digi stamps Mary Ellen offers on her blog. She has a new blog featuring her latest work and I'm not sure if she'll transfer older images or not, so am also sharing the link to her older blog so you can check out all of her so-sweet dearie dolls. To get to the new blog, Free Dearie Doll Digi Stamps, click HERE! To get to her older blog which has this image, Dearie Dolls Digis, click HERE! Make sure you leave a comment and let her know I sent you and be sure to check out her super sweet summer digis (ouch, my tongue is twisted). 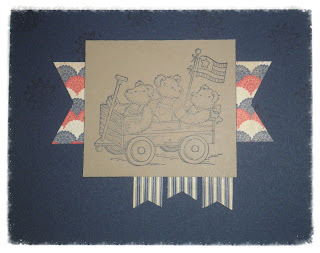 Freebie Friday ~ Patriotic Digi Stamp Alert! If you haven't tried digital stamps before now, this is a great opportunity to do so. :) I was hesitant at first too, but am glad I did. I absolutely love that I can adjust the stamp size to suit what I need. Don't get me wrong, I'm still a die-hard rubber stamper, and love the inks and all that stuff, but these are loads of fun too. Dearie Dolls has some really cute digi stamps and the two I'm sharing with you today were put on the blog over Memorial Day weekend (I believe). These would make darling additions to your digital stamp collection to have on hand for those Operation Write Home AnyHero cards! First up is a sweet little girl carrying a flag. Second is a handsome little saluting guy in flag shirt and wearing a camo hat. While you are there, be sure to check out her other freebies on the blog and see what she's up to. Be sure to tell her I sent you! You can get to the main page of Dearie Doll's Free Digi Stamp Blog by clicking HERE. I visited one of my favorite freebie sites today and came across these wonderful printables that were just too good to keep to myself (thanks, Free Digital Stamps for these and the multitude you put up daily!). There is a darling little "DAD" tie pennant banner (and also printable for matching card) at Hubby Made Me Blog, which she shared last year (along with a matching mug she created). These files are pdf form and do require Adobe reader, but she kindly provides a link to make sure your Adobe reader is the latest version. 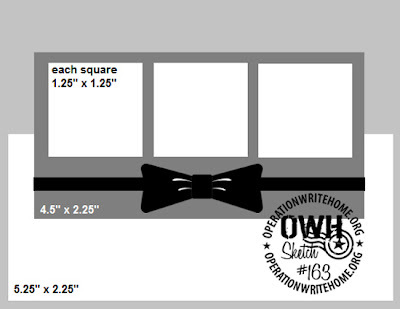 To go directly to the page with the pennant printables, click HERE! To go directly to the page with subway art printables, click HERE! There are so many old projects that I never had a chance to get up here and so I'm hoping to do at least one a week and call it Throwback Thursday. 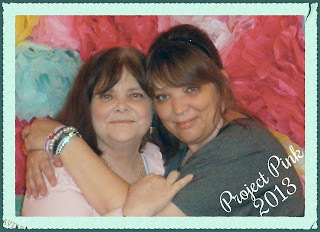 This is a more recent project that I created for the Project Pink conference. 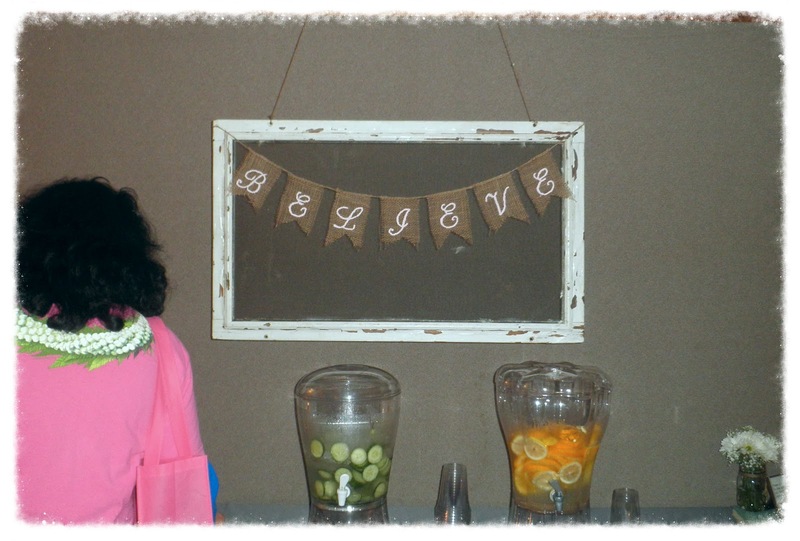 The theme for 2013 was Believe and the person wanted a shabby chic feel to it all. It's a very easy project if you'd like to tackle it yourself! NOTE: It does take a somewhat steady hand and patience because you have to go over it a few times and wait for it to dry in between. It does not have to be perfect, those little "mistakes" can add to the charm. Do recommend that on your first try you use letters that aren't so "busy". Maybe I'll make a tutorial one day but for now, here's how it came about. 1) Cut the burlap pennants. 2) Create, size and print out the letters/numbers/symbols you will need. 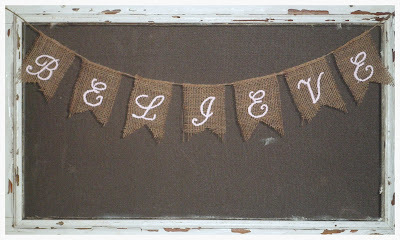 3) Set the letter on the light box, cover with a piece of waxed paper then lay burlap pennant on top. 4) Dip your fine point brush into the paint and then very lightly go over the letter, trying to fill in the spaces you see in black. 5) Set aside and let it dry a bit, do the other letters. NOTE: It doesn't take long for this to dry, especially in the beginning stages when there isn't much paint. For example, by the second pass, I could start it almost immediately after I finished the other letters. By the fourth stage though, I needed to wait 15 minutes after finishing the last letter otherwise the new paint pulled up the wet paint and I was set back a stage. 6) Repeat steps 4 and 5 until satisfied with the look. TIP: A great way to keep paint from drying out in small dish--as well as your paintbrush--is to cover it with aluminum foil in between drying periods. It keeps the paint moist so you don't have to repeatedly get new brushes or new paint. NOTE: Each pass (time you go over with the paint) will create a more "filled" in look. That's why I did not give you a specific number. Some people prefer less and some like a more "solid" look. 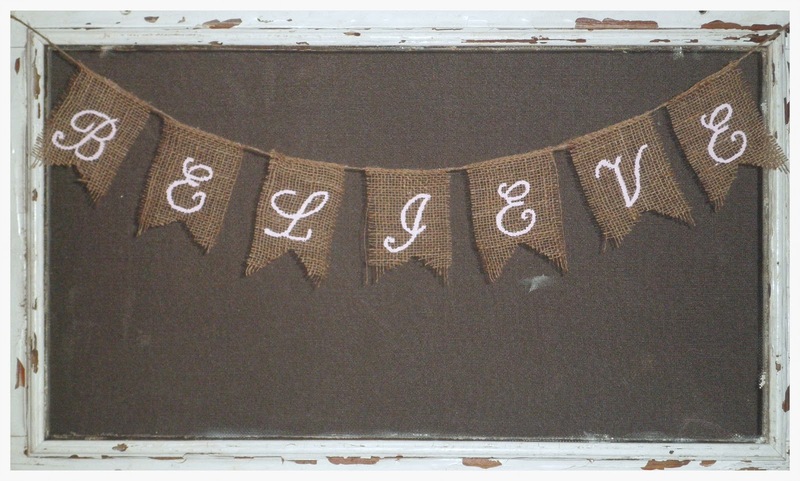 7) Once each pennant is dry, simply glue the top of the burlap pennant to the jute line. It does help to lay them out first in a rough manner and measure spaces between them so you can make sure you don't have a wonky-spaced pennant! This particular banner used seven passes with the paint. By the seventh pass I was simply filling in the "holes" that were left behind in other passes. And just for fun, here's a pic of me and my mom at the conference. Isn't she lovely? I have to tell you, I am blessed with a creative family and am very grateful for all of those years watching my mom DIY around the house. She made the house a home with her creativity and passed it on so that I could bless others too! Not to mention, don't know what I'd do without her. Aside from my husband, she's my best cheerleader and one of the first to always lend a hand when I need it. She's the best! Hope you enjoyed the throwback! Look for more in the upcoming weeks! Good morning! I didn't get this up yesterday, but managed to complete the Sunday Sketch Challenge on Sunday. Woot, woot! This Operation Write Home sketch challenge blog post can be found HERE. I encourage you to go read it and click the internal link to read about the wonderful OWH cardmaker who has left such a wonderful legacy and touched so many lives. Thursday night on OWHtv (Episode #102, I believe), Sandy did a very helpful (sweet'n'simple) instructional on using patterned papers together, not exactly a strength of mine so I decided to work on that during this challenge. Since I had so many papers included, my card does not have a sentiment. Didn't want to make it too busy. What a fun way to start the week! I hope you participated and if not, there is still time. 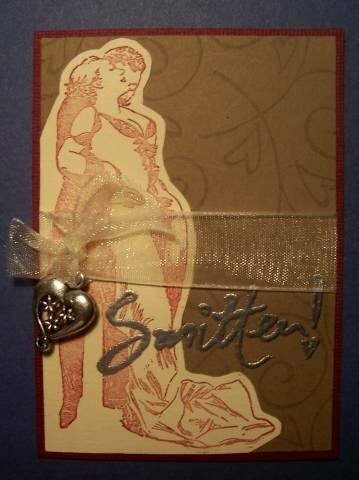 Get off the computer and into the craft room and make some beautiful cards with the sketch! 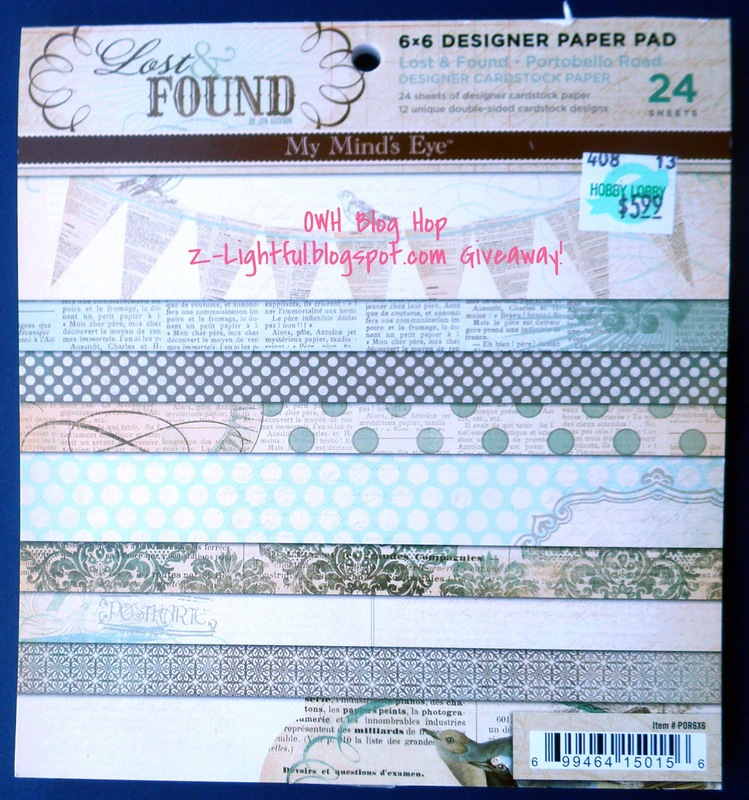 Third Try Works Best and Contest Winners for Paper Pads! Fellow crafters, my deepest apologies for not getting this information up before now. I was supposed to announce the winners last night and was setting up the post when a family drama came up. Then today, my daughter was in a terrible car accident. Everyone is well now and all is good, daughter is resting as comfortably as she can and counting her blessings that she is not hurt worse. Thank God for keeping His hand on her during this ordeal. First up, I took a coloring break this weekend and here's a third try, sans embellishments. I need to get my embellishments back in order (they are a little messed up after a crop and conference). But here you go! I can't wait to make a thank you note for a hero inside it and mail this to OWH! I still challenge each reader to make two Any Hero cards and mail them in. You can find the information HERE. and then I had my sleepyhead sons (it was morning) help me draw the names to keep it all above board. They covered their eyes then dove right in! Congratulations to Reflections :0) and Barbara Greenberg! Please get in touch with me (email me at paperblessings[at]charter[dot]net with your mailing information). I really wish I could send each of you something. 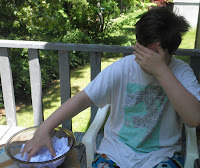 Your comments during my first OWH blog hop were so encouraging even though it was not my best work. You all ROCK! Thanks so much and to my new followers, if you blog, look for me on your blog soon. :) I love to follow new friends! Thanks again for entering my contest and for all the encouraging comments. Please craft well and craft often! Craftsy Free Crochet Pattern Alert! I hope you had a wonderful Memorial Day weekend. :) I was in card-making mode and bloghopping over the weekend, but am looking at other things today in cyberspace and came across this darling little spring scarf on Craftsy. Be sure to hop over there and snag it before it's no longer free and check out their classes and other patterns (some free!) while you are over there, for all kinds of projects! 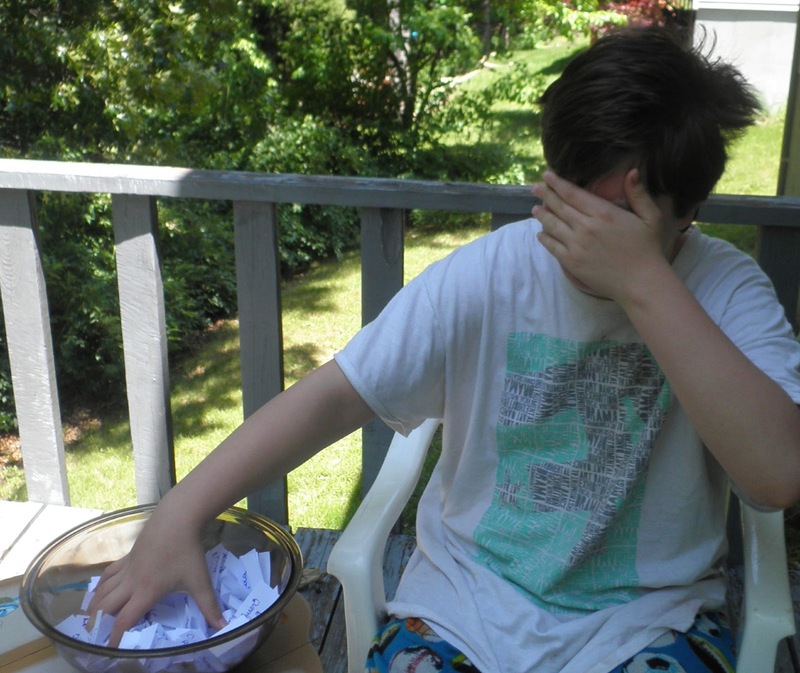 In my excitement to share the bloghop, I totally forgot to say when the contest ended! EEK! I was going to end it at midnight on Memorial Day Weekend and draw a name today, but obviously can't now. 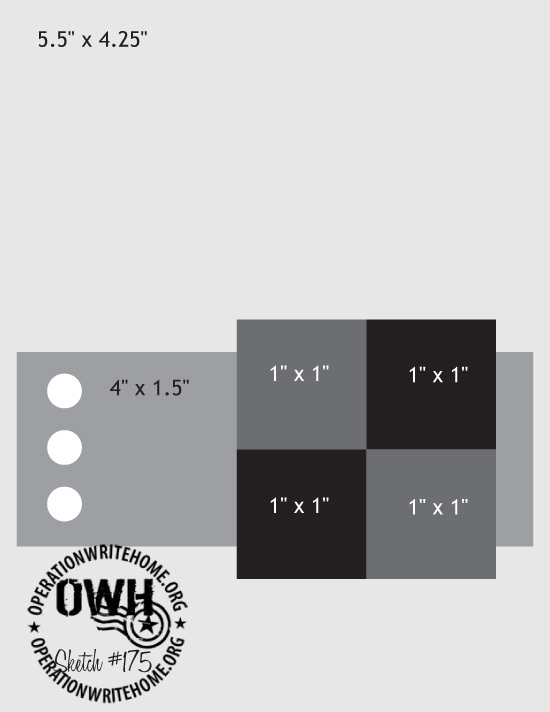 1) Post a comment here about WHY you would like this particular 6x6 pad of paper! What do you think you'll do with it? You get 1 entry for commenting on this blog post. 2) Post a comment on tomorrow's blog hop post! What about the card do you like? What would you write inside? Be creative! 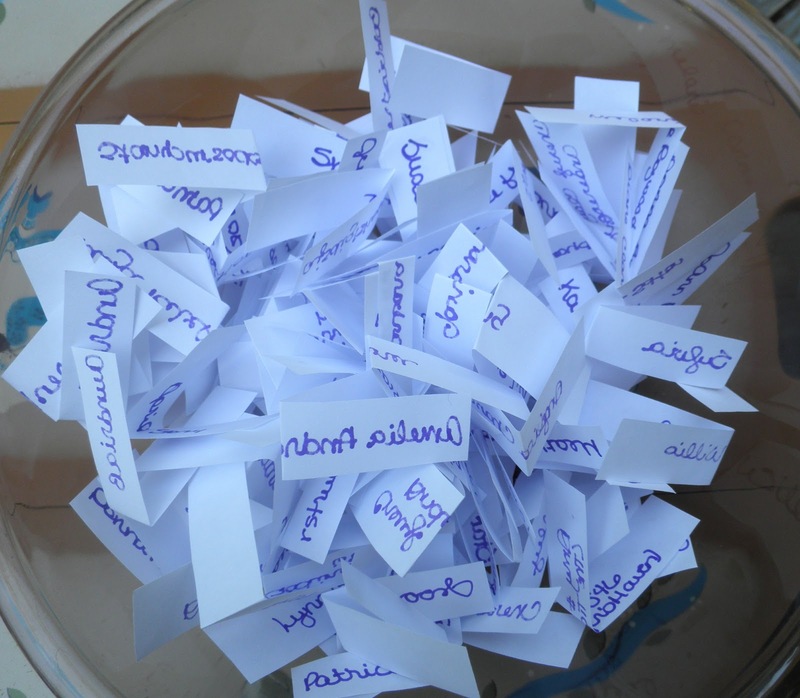 You get 1 entry for commenting on Saturday's blog post. 3) Look up at the right side of the blog...see that email subscribe box? If you really want to follow me, please sign up there. Or, you can sign up via the Google Friend Connect (bottom of right column). I just pretty-please ask only serious subscribers please. 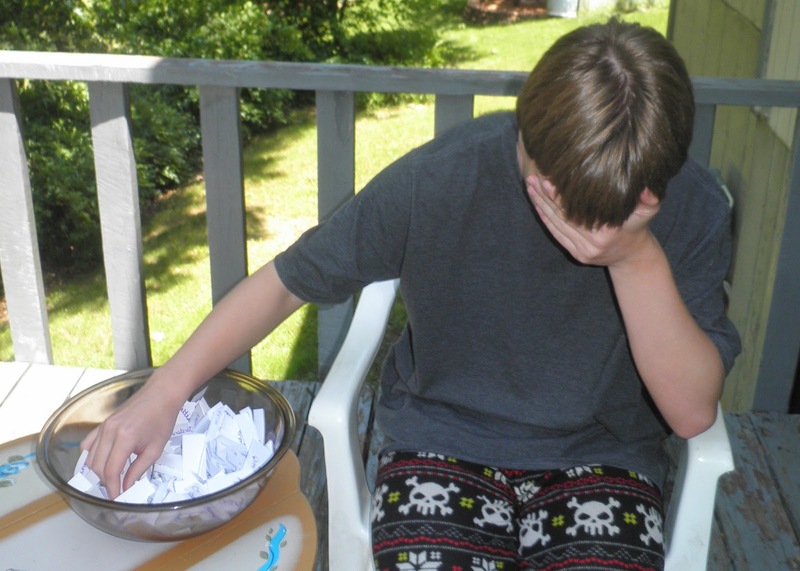 It makes bloggers sad when people subscribe for a contest then quickly unsubscribe when the contest is over. We feel lonely. You get 1 entry for subscribing and posting here that you subscribed! If you are already subscribed/a friend, then please let me know that too for your entry! If you do number #3 please make sure you post on Friday's post or here that you have done so to make sure that the entry is counted!!! We will also have another prize! 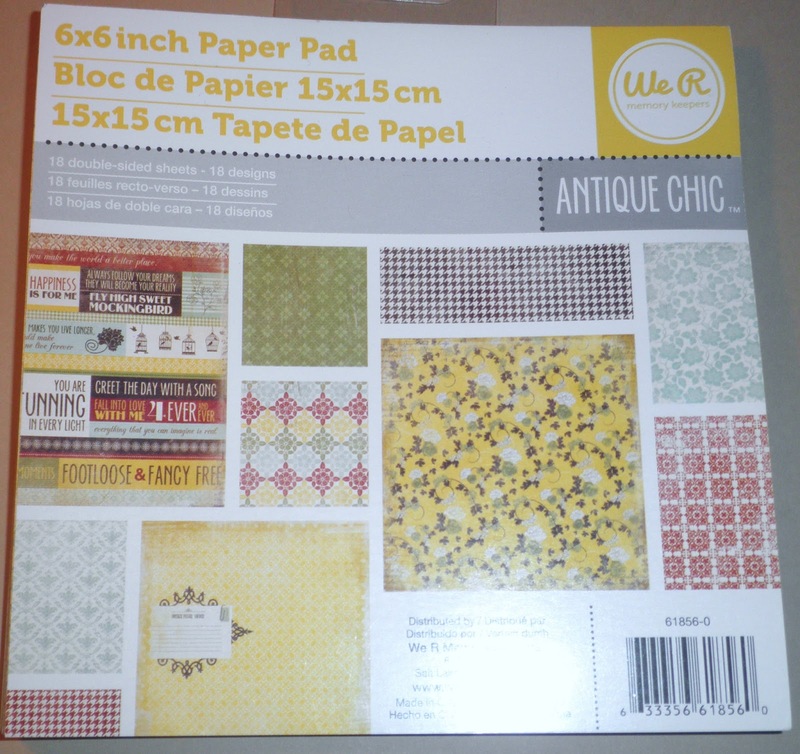 :) The second winner will receive a sweet 6x6 pad of We R memory keepers double-sided papers in Antique Chic! Don't forget to check out the other blogs in the hop. Some contests for goodies have ended, but some haven't yet (they end tonight) and all of them have some great inspiration! Okay, so I stayed up a wee bit longer and played with one more very simple version of sketch 32 (from Operation Write Home's sketches). I'm still not satisfied. I think I just struggle with sketches, as I'm never happy with them when I make cards from them. :( At any rate, here's my KISS version of sketch 32. Sweet 'n' Simple. It might also just be time to retire this image for the weekend. We shall see. It's On! The Memorial Day Blog Hop for Operation Write Home! It's Memorial Day weekend here in the States and that means it's a special time set aside to honor our beloved Heroes. We salute those brave men and women--past and present--who have had the courage to serve our country. Operation Write Home is a wonderful organization that supports our military (and their family and friends) by providing hope and encouragement in the form of some beautiful handmade cards (for our troops to send back home) as well as by sending Any Hero mail to those men and women who might need some love from home. They also host an annual blog hop each year and you get to join in the fun! To visit the many blogs participating (corporate and private) please click HERE! 2013's Blog Hop will focus on sketches again and also the theme is Thank You. We really want to up the ante on Any Hero cards, so that's what I am focusing on this weekend. It's late here and I was short on time due to celebrating another victory in our lives (congrats niece Britt on your graduation!) and so I made a simple Any Hero card to go in the next package. It needs some punching up and I'll play with it some more and update when I can, but don't want to miss out on the fun, so here you go! 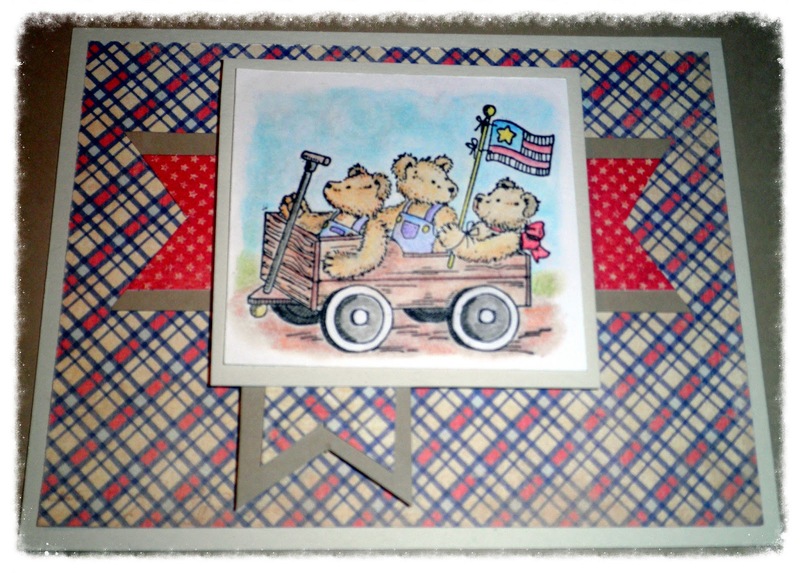 As I said, this is a cute but hurried card that needs a little love and I'll be posting more throughout the weekend if you happen to make it through the rest of the blogs and want to come back and visit. Again, you can reach those wonderful sites by starting right HERE. Also, don't forget to sign up for your chance to win a 6x6 pad of Lost & Found from me! Go HERE for the information! Have a wonderful Memorial Day weekend and don't forget to thank a hero for their service! Counting down the hours until the blog hop begins!! Visit OWH HERE to get to the blog hop on Saturday, Sunday and Monday! As promised, I have a give-away for my wonderful readers. Are you ready? 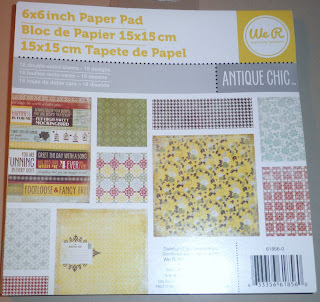 Since my challenge for the weekend involves 6x6 pads of paper, I thought I'd share the fun. 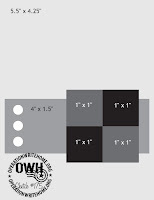 For the give-away I'm giving away a brand-spankin' new 6x6 pad from My Minds Eye! This is from their Lost and Found collection and it's called Portobello Road. It's a gorgeous set of double-sided papers! There are several ways to enter, so pay attention. 4) Visit the other blogs in the blog hop. Okay, no entries given for that, but I think you'll really enjoy seeing all the fun stuff out there and maybe snagging some more goodies! There will be some other treats thrown inside the package as well! And depending on how many entries I receive, we might have a second winner. I don't know, we'll have to wait and see! So, get ready to hop the weekend away in between your plans and I hope you can squeeze out a card or two in the fun. Here's hoping you win! Can you feel the excitement? It's almost time for the blog hop to begin. YIPPEE!!! I mentioned yesterday that I will be challenging myself to make at least a dozen cards in between all the activities of the weekend, and hopefully even more than that. I've narrowed down my goal. 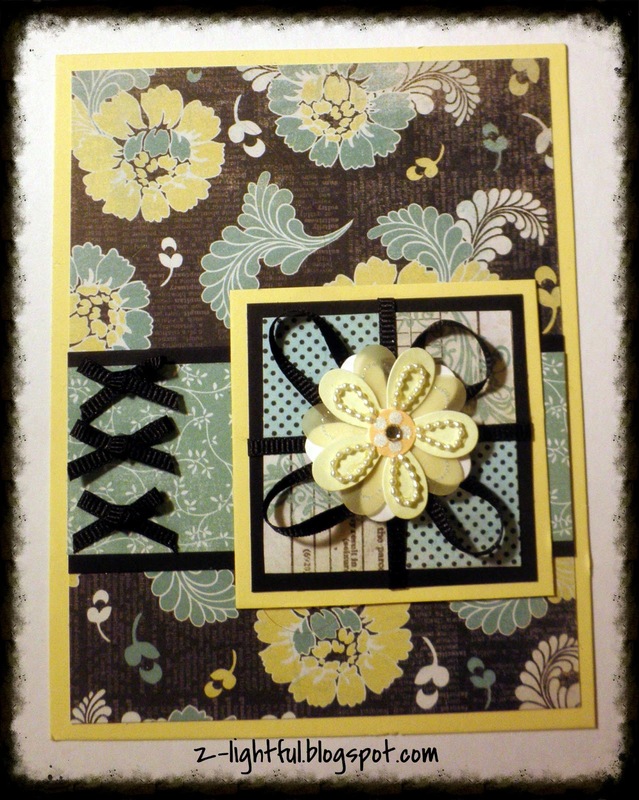 Last night on OWHtv, Sandy talked about her night at the scrap group and how she used an entire 6x6 pad to make a whole slew of cards. They were great! During the episode that aired last night she quickly whipped up two to show us how sweet and simple it is. If you'd like to see the 101st episode, click HERE. After watching her work, I was inspired to use the OWH Sketches and a 6x6 pad to make a bunch of Thank You/Hero cards to send in. I plan on using the "Noah's Ark" method of using two sheets at a time (so two x twos, lol) and work my way through an entire pad of 6x6 paper. The pad I'm using will be from Authentique and it's a 26-page bundle from the collection called PRIDE. If...and that's a big if...I manage to get through that and want to create some more, I have another 6x6 pad from Authentique that is also 26-page bundle but from the collection called RENEW. I thought Pride was more in line with Memorial Day (reds/whites/blues) and the Renew set was a good one that could make feminine or masculine cards. I'll be using Bazzill cardstock for my bases and layers. The theme for the weekend is THANK YOU, if you want to participate too. My goal is still 12 cards, though I would really like to get even more! I will be using sketches from Operation Write Home to create these. I will do at least two of each sketch I use and will post throughout the weekend. While only one post will be linked in for the blog hop, I will update as I get going for those intrepid enough to see what I'm up to. Just be sure to visit all the other blogs too throughout the weekend! There is going to be some great blog candy going around and some tutorials and goodies passed out. In fact, stay tuned for a give-away from me! If you haven't looked at Operation Write Home's sketches, now is a great time to do so! They have so many of them available in at least two downloadable PDF files that you can print. The great thing about them is the majority of them have sizes of the pieces on them--not many sketches do! I encourage you to check it out. CHECK OUT OPERATION WRITE HOME SKETCHES HERE!!!! So, be on the look out for my next blog post later tonight that will share details about my contest/give away and hope you take some time to look at all the fabulous blogs linked up for the hop and also to participate in your own way for Any Hero mail (see previous post for reader challenge). Hi, everyone out there in cyber land! I have missed you all and it sure has been busy around the Z household. The good news is that Daddy's surgeries went well and the cancer has been removed. He is on the way to healing and learning to live with diminished lung capacity. Aunt S does not have cancer and is on the mend too. On a sad note, we lost two family members during this time. Project Pink 2013 is now history and it was a blast! I was blessed to be a part of this year's women's conference at our church and help encourage women to BELIEVE they could create. We made some cute little fridge mini clipboards and flower broach/clips for hair or purses. I was also asked to create some massive stage props! It was short-notice so a lot of fly-by-the-seat-of-my-pants type creating but think the one came out really cute. I hope to have pics of all these creations up for you to see soon! After a week recuperating (and getting ill, getting better), it's time to look forward. This weekend is a holiday weekend here in the States. Monday is Memorial Day, when we recognize those men and women who served our country. I recently became involved in Operation Write Home and am so excited to participate in their blog hop this year! Be sure to visit them by clicking HERE. Take a peek around and see the good they do for our heroes and their families and friends. CHALLENGE! 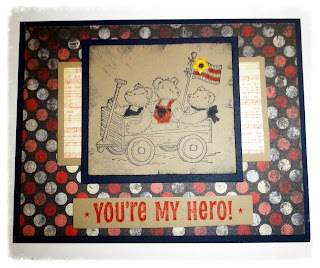 Even if you are not a card maker, I challenge each reader here to send in an AnyHero card or letter to support them. There are men and women in our military who could use the moral support from home. Even something as simple as we appreciate you and are praying for you will go a long way to those brave heroes. If you are a card maker, maybe throw in a few extras and also consider joining this wonderful organization! So, be on the lookout tomorrow and this weekend for more information on the blog hop. I'll be challenging myself (and hopefully you), might even have some candy or freebies, and just love to create with you! Be sure to also make the rounds on the hop to visit all the other good blogs out there supporting OWH and see what they are sharing and perhaps giving away! 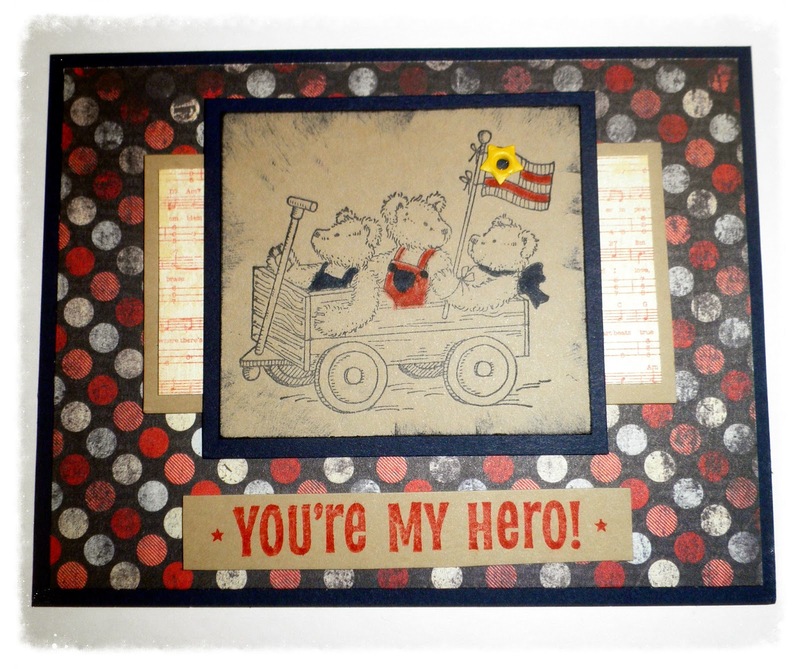 Operation Write Home is a worthy cause for card-makers to help bless our troops and their families. For more information, please click the name link! Each week, OWH has neat activities to keep card makers encouraged and moving forward. I prefer Sandy's OWHtv Thursday night show and the sketch challenges. Sometimes I only have time to make a simple version of the sketch (like this time) but I do try to get them in. You can find the entire challenge post HERE. This card-front is nearly ready to go. I need to affix it to a card base, stamp the back and tuck into an envelope. I only have one sheet of this brown (it's so thick and yummy) so am playing around making a similar sketch card with it, just a tad different. Please forgive the quality of the photo, it's late and I had a full day, lol. Ink - Chocolate Chip, Stampin' Up! Have a fabulously creative week!